November was an enormous month for Skycoin development and community growth. It started with a bang, as project figurehead Synth and crypto legend John McAfee chatted live on stage at the Malta Blockchain Summit, in what was the beginning of a close friendship. Sit down and get comfortable for our longest update yet! Lead developer Synth with John McAfee. John identifies strongly with the Skycoin and Skywire aim to decentralize the internet and has begun spreading the word to his large online following. Work on Skywire mainnet continues, with all of development resources dedicated to finalizing software specifications and bug fixing. The Skywire mainnet is a massive software undertaking. It must have the ability to process hundreds of machine-to-machine bandwidth payments per second and be scalable to hundreds of millions of nodes located all around the globe. It will be worth the wait! The Skywire testnet continues to operate smoothly, with more than 9000 nodes currently online. Skycoin paid out 24,000 Skycoin in testnet rewards for the previous month of October. Check out this excellent video depiction of the three phases of Skywire roll-out. The core Skycoin repository (GitHub skycoin/skycoin) stands as the 11th of 378 cryptocurrency projects as of the past 3 months, as measured by CryptoMiso. This repo alone had more than 500 commits and 50 different contributors. Special mention to ikethedore, gz-c (lead developer Steve) and olemis for their outstanding recent work. Skycoin/skycoin contains Skycoin core and the Skycoin wallet software. It is only one of more than thirty active GitHub repositories building different parts of the Skycoin ecosystem. Each plays an important role in bringing about our vision of global mass-adoption of Skycoin, forming the foundation of the ecosystem, increasing usability of the platform, and driving user adoption of Skycoin-based applications. Along with Ethereum (Solidity language), Skycoin is one of the few blockchain projects with its own programming language. CX is based on Golang and is currently in Alpha stage. We envision an ecosystem of games and blockchain applications written in CX, complete with its own store. We encourage all developers in the community to start coding in CX to help build out this key component of the Skycoin project. Check out our brand new CX homepage here. The drive for Skycoin adoption requires the most advanced technical fundamentals, ease-of-use for users and developers and a suite of highly useful applications. Skywire is the flagship application of the Skycoin ecosystem. A functional and secure mobile wallet is essential in the democratization of any peer-to-peer monetary system. 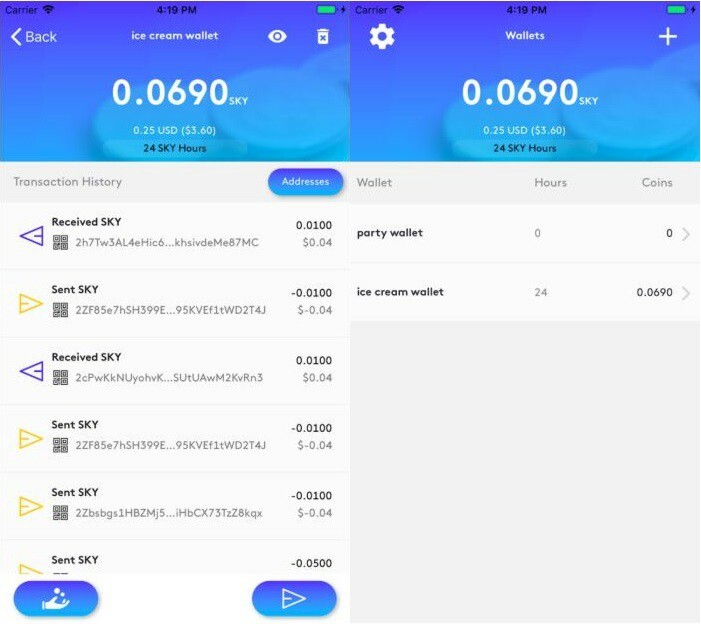 A Skycoin iOS mobile wallet app now joins Android versions to provide all the advantages of the Skycoin wallet for all mobile users. The mobile wallet has all of the important functions of the desktop wallet, including loading and generating new wallets as well as UTXO selection for Coin Hour management and privacy. The Skycoin mobile wallet is now available on iOS, joining current Android versions. Download the app now from the Apple app store. 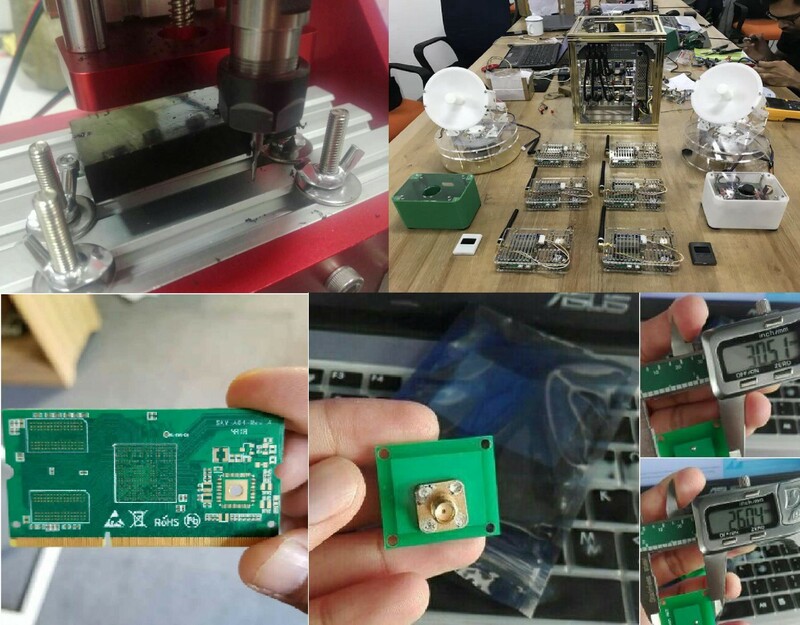 CNC milling machine for Skycoin hardware wallet metal casings (top left), gold-plated Skyminer and antenna prototypes (top right), Skycoin CPU board (bottom left) and antenna gain testing (bottom right three). Synth was extremely active this month providing updates on Skycoin development and his thoughts on the blockchain space as a whole. The Synth vs McAfee conversation at the Malta Blockchain Summit, where he talked about his experiences being kidnapped and the libertarian roots of Bitcoin. Another interview update with with CryptoRich, discussing the exciting partnerships made in Malta, the strong fundamental position Skycoin holds regardless of the current crypto market. A written email response to a poorly-researched (our willfully ignorant?) piece of online journalism, covered in a community article. Some comments on Skywire Meshnet competitor, Althea. “…Skycoin generates Coin Hours, to generate a service. And the service exists to promote the circulation of Coin Hours. And Coin Hours exist to promote the price and ownership of Skycoin. Skycoin is the ultimate perfection of the post-modern, post-industrial economy. We can manufacture hardware wallets at a loss and make it back in the coin price. With much anticipation, we published Part II of a four-part series on the fracturing of the internet. ‘Net Neutrality and the Tyranny of the ISPs’ is an in-depth article exploring the exploitation of people around the world at the hand of corporate Internet Service Providers (ISPs). For those with no understanding of cryptocurrencies or blockchain, it explains how ISPs can charge exorbitant sums due to their control of the physical infrastructure of the internet. It then describes how mesh networks and wireless community ISPs can solve this problem. Skycoin, Skywire and Skyminer: a Primer was also published in November. This is a concise yet detailed explanation of the key aspects of the Skycoin ecosystem which resolves confusion around Skywire the networking protocol and Skywire the physical mesh network. Malta Blockchain Summit was the main exhibition for Skycoin in November, and the official video of this event can be found here. We sent a small Western contingent to the Web Summit in Lisbon, Portugal to proudly show off the Skyminer — check out what the team got up to here! Skycoin was officially listed as a Binance ‘Gold Label Project’, included in the top 10 of 100 projects. Binance Info Gold Label provides a platform for blockchain projects to keep their investors updated, improving the standards of transparency in the industry. Skycoin is now listed on BitBNS, providing Skycoin trading to the people of India. Stay tuned for more exchange news in the coming months as we look forward to USD/SKY fiat pairs. “an impressive platform and a well-developed ecosystem with a strong team of individuals… trying to solve a problem not yet tackled by the blockchain community, and that is the ISPs and their anti-competitive behavior… This is what separates Skycoin from its competitors. John McAfee was interviewed by FreeFourAll, where he spoke glowingly of Skycoin and Skywire. This interview was followed by another chat between FreeFourAll and MacSkyver, Skyfleet member and Events Lead for Asia. Juan Pablo emerged strongly in November with three informative articles, starting with ‘John McAfee, Brandon Smietana and the Skycoin ‘Skyminer’and followed by ‘Synth on Skycoin and the state of Crypto in 2018.’ This was a great article re-posting Synth’s written rebuttal to a very poorly researched (or wilfully ignorant?) media piece post-McAfee. He rounded out the month with ‘Skywire vs Althea — necessary factors for a globally scalable Meshnet’, a summary of Synth’s rebuttal to the founder of Althea (a Skywire competitor) who had commented on Skywire. The Wikipedia debacle was an embarrassing display of incompetence and possibly intentional censorship. Lawrence Quolloi also commented on it with ‘The curious case of the Skycoin Wikipedia page.’ The deleted Skycoin entry can be read here. MacSkyver released two great articles — the second installment on how the Skyfleet can maximize Twitter engagement, and a transcript of a selection of Synth’s fascinating Telegram voice messages.This is the first published transcription of Synth’s invaluable musings for the community’s reading pleasure, many thanks! MacSkyver also released a fantastic video overview of the October Community Update. Christian Ott mentioned Skycoin in his latest article ‘Crypto Projects Developing Physical Products.’ It is clear from Christian’s article that Skycoin is truly in a league of its own with such a strong hardware suite supporting solid software development. Be sure to make a Medium profile and clap for all the official and community Skycoin articles — every clap, retweet, reddit doot and Telegram re-post helps promote Skycoin and enlighten more people about the decentralized future we are creating. This month we crossed the milestone of one thousand Medium followers — let’s ensure the next thousand comes even sooner! Lead by Skyfleet member Caribou, the Skycoin Wiki has finally been launched. The Wiki aims to be the definitive, up-to-date, centralized repository of Skycoin information, collating disparate information sources from GitHub, the Skycoin blog, Skycoin launch thread on Bitcointalk, various AMAs and video interviews with Synth. It requires knowledgeable and dedicated Skyfleet to begin contributing, so apply to become an editor and get to work! Valued Skyfleet Africa member Blevenec received a load of Skycoin merchandise which he began spreading word around his native Benin, West Africa. Skycoin and Skywire holds great promise for the people of Africa — thanks for your hard work Blevenec. Skyfleet members mitjag and dbricman and have created a Skywire node information page that gives a graphical depiction of the number and location of Skywire nodes and updates daily. This is an excellent tool for watching the Skywire network grow! Welcome to all new Skyfleet members who built a DIY Skyminer this month. Leading the charge was Good Guy Biker and his Crypto Kings crew from Vancouver, Canada who are bringing large numbers of Skywire nodes online. We also saw photos of an hilarious Lego Skyminer, great work! 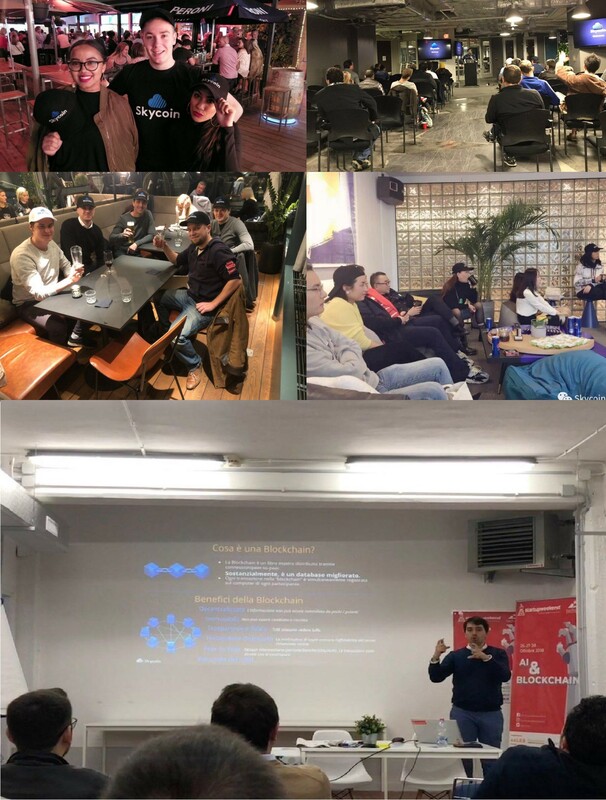 Many Skycoin meetups happened around the world in November, including Finland, Puglia, Italy, Austin, Texas, Perth, Australia and Shanghai, China. To host your own Skycoin meetup, access the pre-prepared presentation material here. Make sure to tell everyone about it in your national Telegram group and the Skycoin Meetups Worldwide Telegram group. You can discuss any facet of the Skycoin project that you prefer! After the meetup be sure to tweet and post photos, showing how dedicated the Skyfleet is in supporting Skycoin’s vision for a decentralized future. Worldwide Skycoin meet ups were held this month in Perth, Australia (top left) and Austin, Texas (top right), Finland (middle left), Shanghai (middle right) and Puglia, Italy (bottom). John McAfee’s partnership announcement led to a surge in interest in Skycoin, and our Community Managers have been hard at work catering to all the new interest. Sudo, Levitys, therealssj, Moojie, Lawful, Jialee & Professor Kubyashi have done an outstanding job in the Skycoin main Telegram chat, which now numbers over 9800. Caribou, Red Pilster & Falcone District are just some of our solid Skyfleet members who have been helpful in assisting them. The Skywire Telegram chat is now over 2000 members, with K, asxtree, Mr Hodlr & BigOokie patiently helping newcomers and experienced Skyfleet with all their Skyminer questions. Skycoin Meetups Worldwide chat continues to grow as the hub of Skycoin information material with Daken and Lauren ensuring people have high-quality material to run successful Skycoin meetups. The Skycoin community coloring contest produced several artistic “masterpieces”. Special shout out to community meme lords CryptoLifeCrisis, NotMacroBusiness, SadKen, Deus Nero, Mr C for their relentlessly creative work promoting Skycoin on Twitter and spreading the Skycoin message throughout the busy month. And that’s all folks. Our biggest community update article coincides with the new 2018 market low, and a Skycoin market cap of $12 million. As you can see, Skycoin developers and Skyfleet continue to build out the ecosystem, regardless of price, as we relentlessly pursue our vision of global mass adoption of Skycoin. Checkout our BlockDelta profile for additional articles.